Wow! 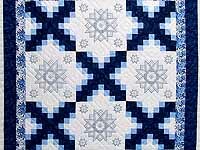 We love these cross stitch embroidered quilts, but so few women still make them that we rarely have them on offer. 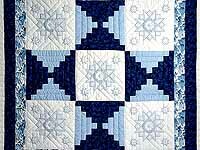 This one is very well made with great stitching and lovely fabric selections. Made here in Lancaster by an Amish woman. Only a few women here continue to make these embroidered gems. We wish we could offer more! 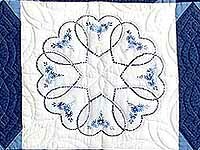 This one is very well made with great stitching and lovely fabric selections. 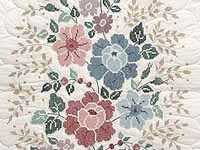 Note the lovely subtle mottled pink and blue on cream border print.Made here in Lancaster by an Amish woman. 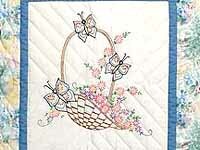 A delightful collection of embroidered flower baskets. 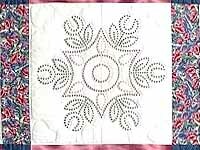 Lovely coloring and fine embroidery.. 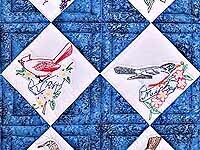 Note the abundance of fine quilting and the great fabric selections. Made in Lancaster by an Amish woman. Only a few women here continue to make these embroidered gems. We wish we could offer more! 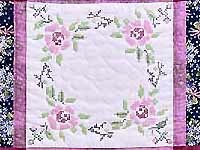 This one is very well made with great stitching and lovely fabric selections. Made here in Lancaster by an Amish woman. 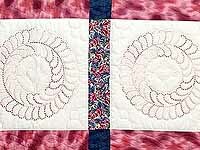 Another rare embroidered quilt. 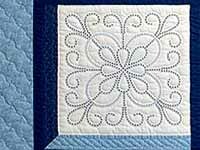 Attractive cross stitch hearts and lots of fine quilting make this quilt very special. Only a few women here continue to make these embroidered gems. We wish we could offer more!. Made here in Lancaster by an Amish woman.